Maybe this is too much information, but anyways… Lately, I have found that after eating cold cuts/deli meats, that I have a quite upset stomach and release CO2. It could be the nitrates or my self-diagnosed lactose intolerance, but all-in-all I am quite uncomfortable about 2-4 hours after my yummy mortadella, soppressata or ham, and cheese sandwich. Bummer, RIGHT?! Because of all this, I’ve been brainstorming alternative sandwich ideas for some time. Leftovers and salads are a great option, but sometimes there are no leftovers (or you don’t feel like having them) or interesting salad combos are not available with the ingredients on hand. Added point, I do not want to turn to frozen microwaved meals (once a week maybe, but more often – no thank you), the very expensive cafeteria food offered by the outlet at the university, or having to walk down the mountain to get lunch on the nearest boulevard – although this option can be quite tasty; there is always yummy sushi and great pub food that awaits! SIDE NOTE: For those of you that are from Montreal, the university is Université de Montréal and the boulevard I’m talking about is Côte-des-Neiges. If you have a chance, check out McCarold’s. I promise you won’t be disappointed, I absolutely love their chicken and leek pot pie. 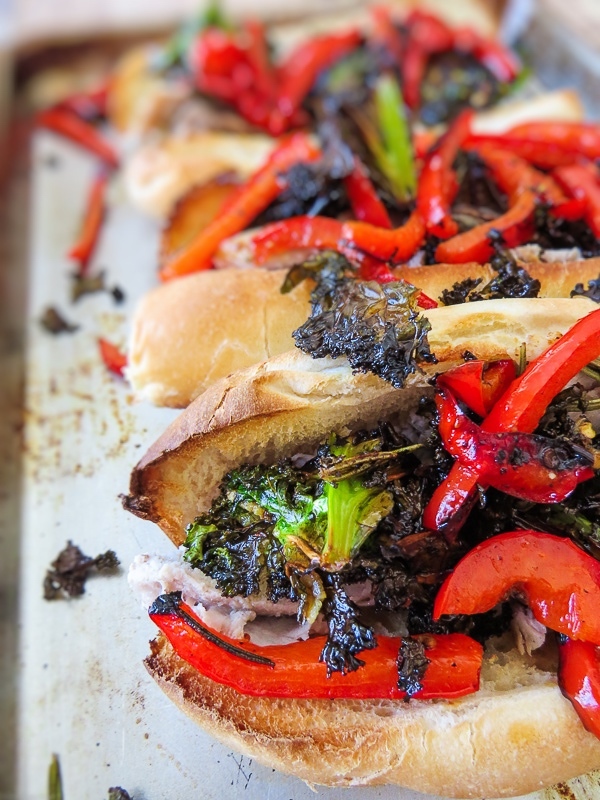 Anyways… This is where the idea for homemade porchetta sandwiches comes into play. Usually, I purchase porchetta and rosemary cold cut meat from my local trattoria/grocers – obviously, this leads to undesirable side effects. ‘So why not make some?’ was obviously the next thing that popped into my brain. 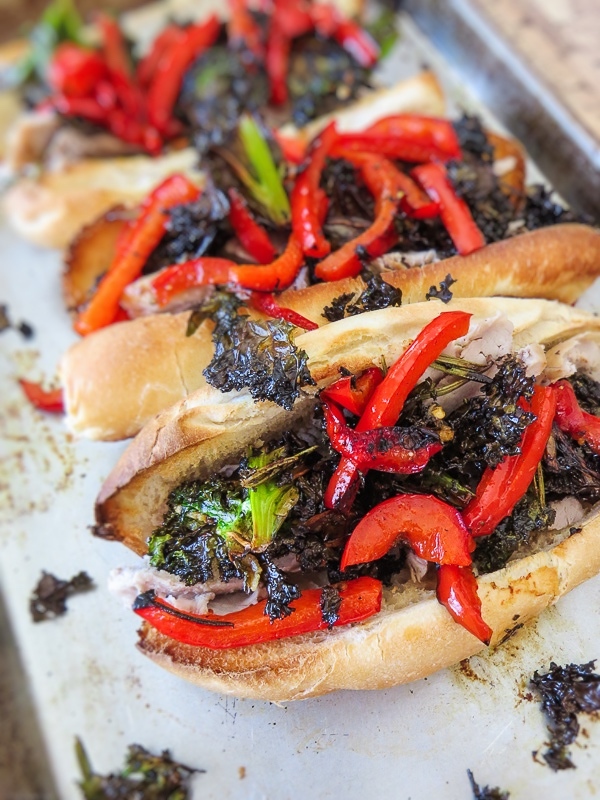 So, with some inspiration from Cook’s Country One Pan Wonders – an amazing book filled with awesome recipes, I know I have at least two dozen post-its in my copy – I made these Porchetta Sandwiches! 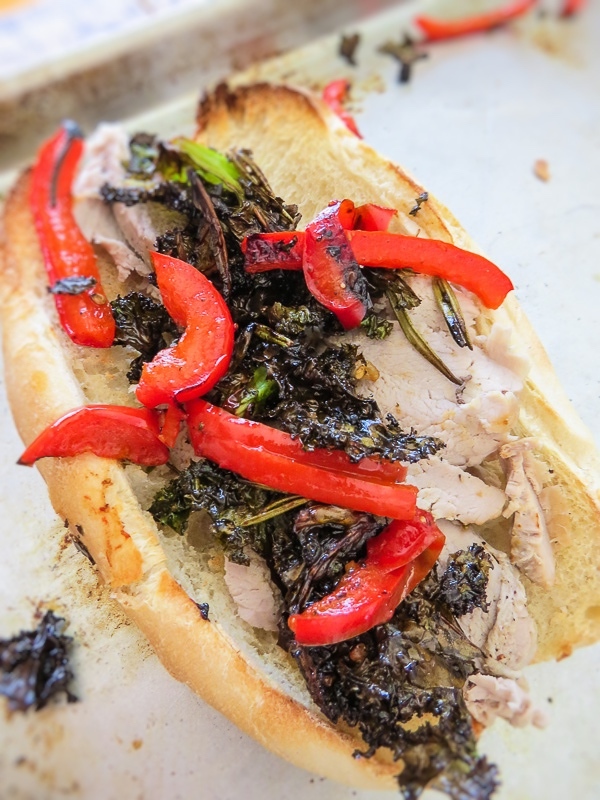 They’re made with roasted pork tenderloin seasoned with salt, pepper and rosemary, topped with roasted peppers and onions with garlic and chili flake seasoned kale: ultimate deliciousness. 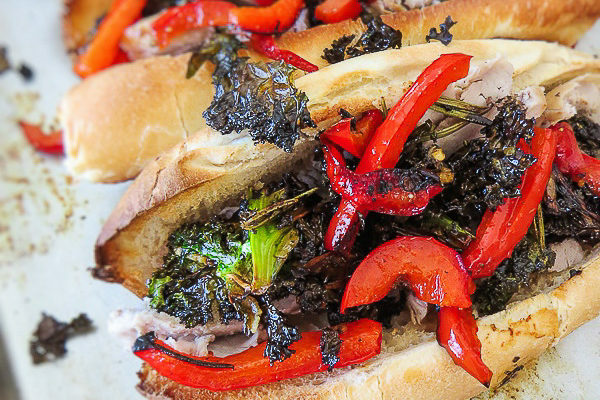 Now yes, I would have preferred rapini instead of kale – and why you will see rapini in the recipe in lieu of kale as pictured. Why? I love when I have only one pan to clean, and that is ultimately the goal of this recipe! But by having it with kale, the kale will crisp up in the oven and become crunchy and chip like, which is maybe not ideal for a sandwich (for a kale chip recipe see this post: Crunch Alternative: Kale Chips). So if you’de dead set on kale, sauté it in a pan on the stove as the tenderloin and peppers/onions are roasting in the oven. On baking sheet, season the pork tenderloin with 2 tbsp. oil, rosemary, salt and pepper. Roast for 10 minutes. During that time, toss rapini with 2 tbsp. oil, garlic and chilli flakes in a bowl. In a separate bowl, toss the bell pepper and onion with the remaining oil; season with salt and pepper to taste. Remove tenderloin from oven, flip onto other side and add the rapini and pepper/onion mixture on either side of the pork. Return to the oven for 20 minutes or until the tenderloin reaches 145F and the vegetables are browned slightly. Once cooked, remove the tenderloin from the pan and tent under aluminum foil letting sit for 5 minutes. Place the vegetables covered in a bowl. Take the baking sheet and wipe with a paper towel to remove oil and then place the subs face open on the sheet. Bake for about 5 minutes until nicely toasted. 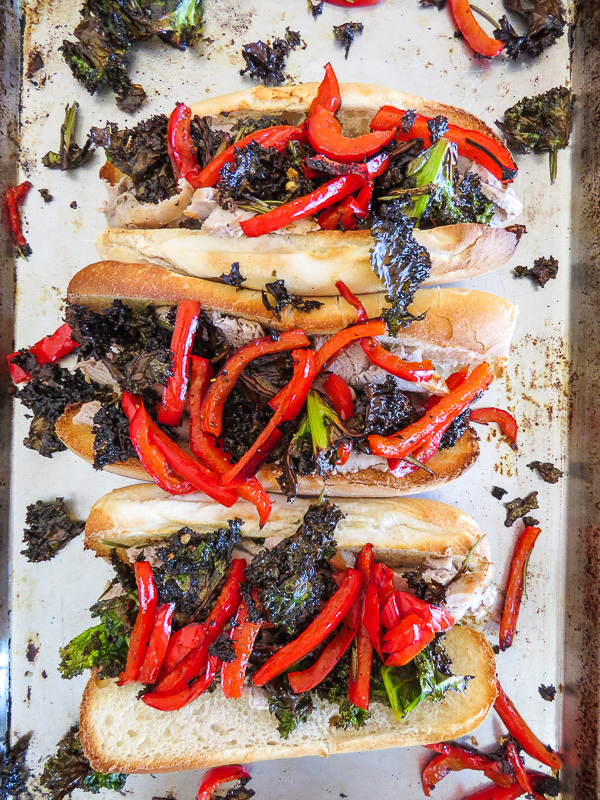 To make sandwiches, slice pork as thin as possible and construct sandwiches with the pork, rapini and vegetables. Eat right away! You can swap rapini with another leafy green. If choosing kale, the kale will become crispy and chip like and therefore you may want to consider sautéing the kale separately in a pan. Add some cheese! Try sliced provolone or mozzarella – super yummy when melted on the bread. If you’re making these for packed lunches the meat and vegetables store really well separately in airtight containers. The meat can be kept for a week whereas the vegetables for 3 to 4 days.